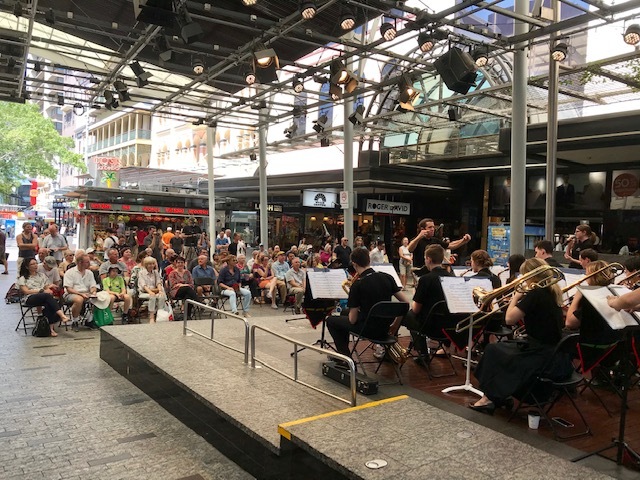 On Sunday 28 October the QYO Big Band performed their final concert for the 2018 QYO Big Band season at the main stage in the Queen Street Mall. The Big Band performed two 30 minute sets at 12.00 and 1.00pm on the Main Stage. The band attracted and held the passing audience for the duration of the performance with approximately 350 people stopping to listen and applaud the ensemble during each of the 30 minute concerts. The extensive repertoire performed by the ensemble engaged and entertained the audience with such favourites as How Sweet it Is to Be Loved by You, LOVE (including actions by the band), Sway, S'wonderful, Sunset, Orange Coloured Sky, It Don't Mean A Thing If It Aint Got That Swing and What A Difference A Day Makes. As always the big band vocalist Jessica Spina was a popular performer with the audience. The various big band improvisational instrumental soloists were also supported with much applause from the audience. The QYO Big Band as always conducted themselves in an extremely professional manner, showcasing their extensive individual musical talents, and ability to perform as an exceptional big band ensemble. The Big Band have had an outstanding 2018 Season under the musical direction of their Musical Director, Mr Bohdan Davison. 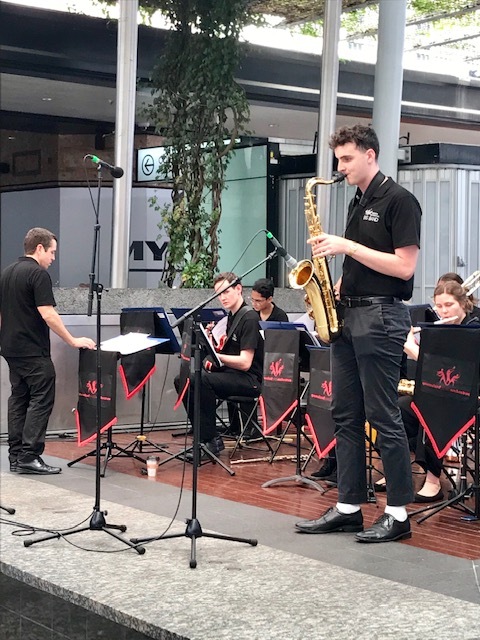 This performance in the Queen Street Mall was a fitting end to a stellar season where the Big Band have excelled as musicians, as a Big Band ensemble, and as ambassadors for the QYO Program. 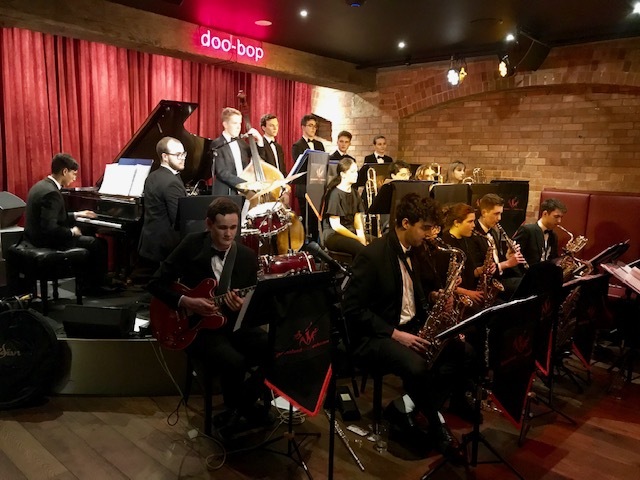 QYO Big Band performed at the DooBop Jazz Club which is one of Brisbane's most popular new live jazz club venues. On Tuesday nights the DooBop venue features big band ensembles. Some of the best big bands in Brisbane and from across Australia have performed at the venue to date. The QYO Big Band were invited to perform at the club on Tuesday 16 October. The venue was sold out with approximately 120+ in the audience. The QYO Big Band musicians really took to the venue and the atmosphere created by the receptive audience delivering an exceptional performance. The big band performed two 1 hour sets from 8.00-9.00pm and 9.30-10.30pm. They performed a variety of big band charts from the genres of swing and jazz both traditional and contemporary. The repertoire included Brassilience, Sugar Hill Penthouse, Channel One Suite, Sister Sadie, Blues in Hoss Flat, Moanin, Come Rain or Come Shine, and Killing Me Softly, along with many other charts. The talents of the musicians within the ensemble were featured with a variety of extended improvisational instrumental solos performed by a number of the big band musicians. The bands vocalist Jessica Spina was as always featured in the performance and received much acclamation from the very responsive audience. A testament to the quality of QYO Big Bands performance is the fact that DooBop have issued an open invitation for the ensemble to come back and perform at the venue in the future.